Yvonne Brill, a pioneering rocket scientist who invented a more efficient thruster to keep satellites in orbit, died last week at age 88, according to news reports. 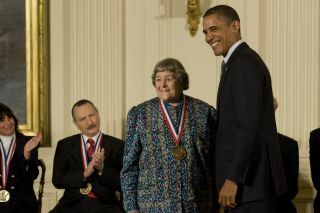 Over her career, Brill contributed to the propulsion systems of spacecraft from the first weather satellite TIROS to the Mars Observer, and she was awarded the National Medal of Technology and Innovation in 2011 by President Barack Obama. She died in Princeton, N.J., last Wednesday (March 27) of complications of breast cancer, her son Matthew told the New York Times. Brill grew up in a suburb of Winnipeg and attended the University of Manitoba, where she was barred from the engineering program because she was a woman, so she studied mathematics and chemistry instead. She first landed a job at Douglas Aircraft in California but took time off her career in the 1950s to raise her three children. When she returned to the field, Brill joined RCA in Princeton and patented the hydrazine resistojet, also known as the electrothermal hydrazine thruster, or EHT. The system, now standard in the industry, allowed engineers to more efficiently alter the position of satellites in a geosynchronous orbit around Earth. Brill also worked at NASA from 1981 to 1983 to help develop the rocket motor for the space shuttle, according to the Times. "She truly represented the best of what American aerospace engineering and system development should be — a pioneering spirit coupled to a clear vision of what the future of an entire area of systems should be, with the ingenuity and genius necessary to make that vision a reality," Mike Griffin, president of the American Institute of Aeronautics and Astronautics, said in a statement. "While we are saddened by her loss, we salute her for her innovative system development, and for being a trailblazer at a time when women were not encouraged to enter the science and technology fields," Griffin added. Brill sometimes spoke about the challenges she faced as one of the first women to work in a male-dominated field. In a 2005 interview with the Society of Women Engineers, Brill recalled the reservations some at RCA had before she was hired as a propulsion engineer. "I always remember there was a very old-line person, typical stodgy old-line person in charge of personnel. And his argument was, 'How could a woman with three children ever get to work on time?'" Brill said. "Years later … he apologized to me and said I really had worked out very well."